And this is when I discovered that the ASL for "crazy" is remarkably intuitive. MANNN it's been like, a year since I drew this page. Back when I was wondering if I could even pull this off! Now it's going ONLINE FOR REALS! My excitement will wear off eventually, I swear. Feel free to explore the new website - if you see anything weird, please, let me know! If you DON'T see anything weird, then you have my amazing brother Flak to thank, since he built a lot of this site from scratch, and helped me with everything I contributed. He is the best. EDIT: I'm apparently addicted to TopWebComics because I caved and made a vote incentive. It's the process work for page 1! THERE'S... THERE'S A BIT, haha. I don't know how much you'll learn necessarily, especially since I tend to translate a little loosely when she's signing. But yay! ASL love! Yay for ASL! I took 2 years of it in college... and unfortunately I don't remember much of it. I should go back and look at my old textbooks. Aw, man! Two years of classes; you probably know a lot more than me! That's awesome. Wow, that's ambitious. Sign Language in a webcomic? I really looking forward to following this one! YESSS I'm so excited for this comicccccc YES!! The first page looks great, especially the colors. I did an archive binge on TNH, but dropped it after a while. I did check in on it a few times, and I like your style, but I just had so many webcomics that I'm following and I sort of lost track of it a few times. Good luck, and I'm definitely going to keep up with this one. Oooooooooh! Nice art! I'm hooked! Well, I'm on this like butter on toast. 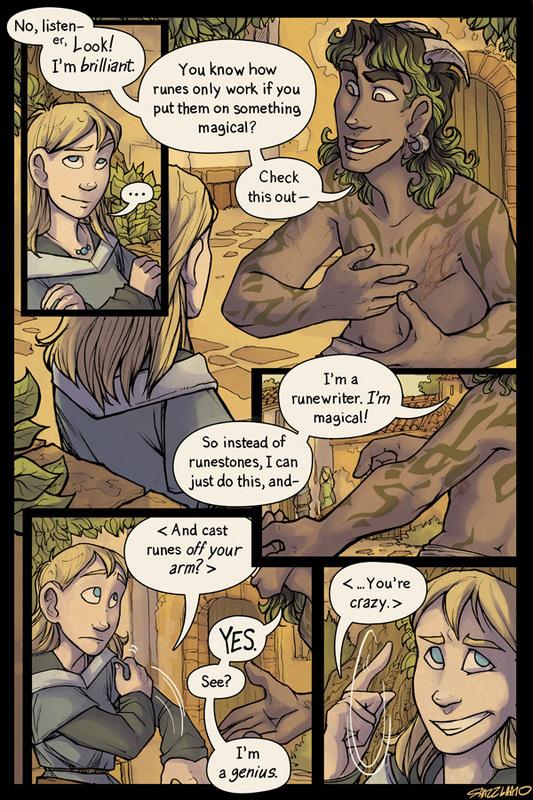 I love how Tareth's "Speech" bubbles are coming from her hands. Since she's using sign language, it makes a good deal more sense than having them coming from her head. Thank god someone tried to teach me british sign language, when they thought I might have never talked. I'll pick this up well enough, and probably end up teaching it to my baby cousin. Trust me, Miss Shazz, my level of excitement is surpassed only slightly by yours. Excuse me while I bounce up and down, uttering such amazingly articulate statements as "Eeeeeeeeeee! :D". Gah, had to use one of my native letters for the name of the world eh, and then inventing your own way to pronounce it. Now I'm gonna mispronounce the name of the world forever. Anyways, I'm from Denmark, so the language would be Danish. I love Severian's hair! And the colors on this page are nice and warm. It really goes well with the colors on the website. The fact you have a character that speaks through ASL delights me to no end. Just wanted to say that. I hope your excitement takes a long, long time to wear off. A creator's enthusiasm for a project is always wonderful to see, and it can be so infectious! And you're one of the best artists for using sign language in a work. Something about your style communicates movement so well. This should be fun. This looks...really good. I need to go back and catch up to As We Were, but I loved that as well. Bookmarking this. There seems to be a problem with the RSS feed. I have been unsuccessful in subscribing to this comic through google reader. Also the RSS link at the top does not seem to do anything. I would love to follow this comic, but I do not believe that I will remember to check without the RSS feed prompting me to do so. The ghosty buttons up there aren't malfunctioning, they're just not implemented yet. Since Flak and I (mostly Flak) built the site from scratch rather than using ComicPress or something, it didn't come with one built in -- RSS is the next thing we plan to work on, no worries. :3 But thanks for letting me know! Awesome, thanks! In the meantime, be sure to Twitter about it. "Since Flak and I (mostly Flak)..."
I can't wait to see how this comic goes - it is extremely exciting! One of the things that makes it tough is that sign language is like other languages -- it kinda varies from Deaf community to Deaf community. Some native signers are iffy about initialised signs like that, especially, since it's an influence from English. End result is that some signs can be done a few different ways and both are "right" depending upon whom you ask -- I found a couple of resources that list this one, without the C-handshape, as an acceptable version as well. ...upon further reflection the easy answer would have been "obvsly they are not speaking ASL for reals, this is not America" ...but for some reason I actually do want to try to get it right! Yes, and remember, the "correct" sign will be wrong for about half of Deaf people anyway. ASL is still very, very young as languages go, and many Deaf people have home sign and oralist influencing. Basically? Don't sweat it, Shazz. You're doing fine. Didn't notice the hand-speech-bubbles. Tres cute! I love the comic already and we are only on page 1... but then it does have my name in it!!! Been following TNH for awhile now. Super excited to hear that your starting another comic. Hopefully it doesn't get lost in the great forest of webcomic bookmarks. JK would never forget about this not after the awesome first page. "I'm a genius." Hey, I'm showing the comic as a broken link now. Something up? Not that I know of. D: It's still working for me. If you're still having the issue -- what browser are you using? Chrome. And it does seem to be browser-local. Firefox works. Weird... Chrome is usually the good one for me. Looks like it's an issue with subdomain. "www.runewriters.com" loads everything. "runewriters.com" loads everything but the comic image. Flak and I took a look; we couldn't replicate the problem, but Flak suggests that Chrome might be having issues with caching? He said to try a force-refresh (hold shift + click refresh) and see if that helps. Hang on, is runeboy signing too, or is Tareth reading his lips? Well, while you see him moving his hands. He is probably speaking, theres no movement lines accentuating the words. Not to mention the word bubble comes from his mouth. A minor oddity with the site: when I go to the "archive" page, the site jumps a few pixels to the right compared to the other pages. ...which, it occurs to me, seconds after posting, is probably due to the scroll bar that appears on the right at the other pages, but not at that one due to it fitting on the screen.